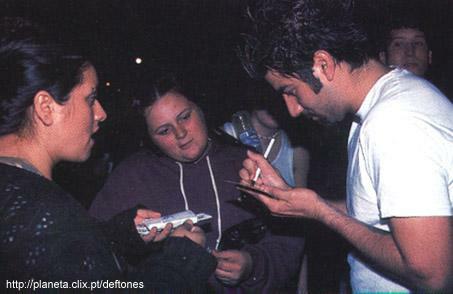 Have you ever got autographed stuff from Chino? If yes, perhaps you’ve watched that he writes in a very funny way… He holds the pen with the back of his thumb!!! It’s damn weird how he writes! You can see a pic of him signing some stuff |here|. Also about Chino autographs I remember that I asked him why he draws ‘pentagrams’ and ‘hearts’ before his name, but he said he make that for no reason at all. Before I met him I thought the ‘pentagrams’ where for boys and ‘hearts’ for girls. But I was wrong cause he signed my ‘White Pony’ with a heart.